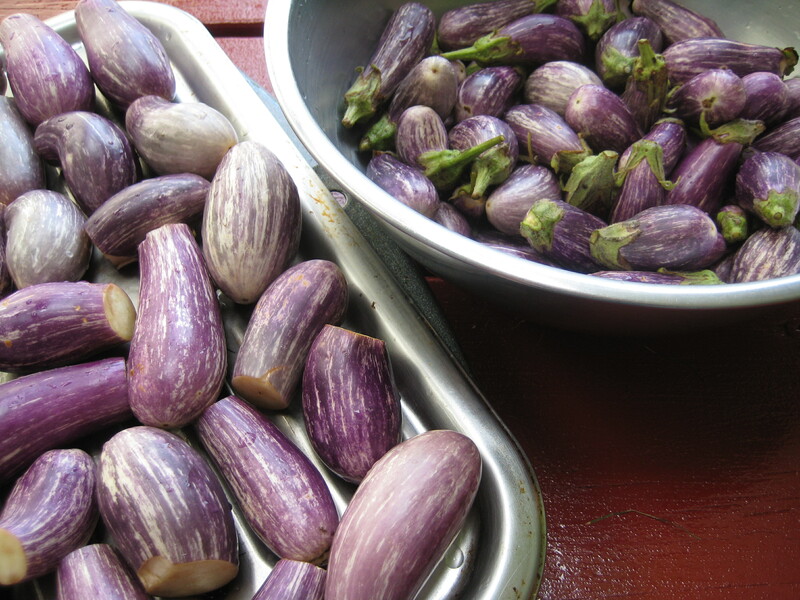 As the nights are getting chilly, the skin of the delicious Fairytale eggplants toughens. A few days ago the eggplants melted in your mouth. Now you can still eat them whole, and they are still good, but they are not at their peak any more. I picked my six plants clean and used the larger ones for a dip adapted from Deborah Madison’s excellent Roasted Eggplant Dip with Dill, Yogurt, and Walnuts, which I like better than traditional Baba Ghannoush with tahini. As eggplants and eggplant skins are a good addition to vegetable broth (here is my recipe), that’s where all the other tiny eggplants are going. Not a single eggplant left. I will for sure grow those again next year! There is more waste from all the skins of the small Fairytale eggplants, therefore I started with a full 2 pounds of eggplant instead of the 1 1/4 pounds in the original recipe. Also, I always throw in a handful of dill fronds (all tough thick sprigs removed) instead of chopping the dill, as everything gets finely pureed in the food processor anyway. Freshly milled black pepper 1. Preheat the oven broiler and set the rack about 5 inches from the heat. 2. Cut the blossom ends off the eggplants. Put the eggplants in a large bowl and toss them with a little olive oil to coat evenly. Distribute them evenly in one layer on a roasting pan and place them under the broiler. Stand by closely, they turn brown very quickly. Once the tops have slightly charred, turn them and broil from the other side. Test one eggplant to check if the skin can be easily removed; if not, let the skins char some more, turning the eggplants as needed. Remove from the oven and cool slightly. 3. As soon as the eggplants are cool enough to handle, remove the skins. The easiest way to do this is by making an incision along the length of each eggplant and flap it open. Collect the pulp in a bowl and set aside to cool. 4. Lightly toast the walnuts in an non-greased pan. Let cool, then place it in the food processor, together with the eggplant pulp and all the other ingredients. Puree to a fine consistency and salt and pepper to taste. Alternatively, you can also puree the dip with a stick blender if the bowl is large enough to hold all the ingredients. Scoop the dip into a container with a tight-fitting lid and pour a little extra-virgin olive oil on top to prevent it from drying out. Refrigerate. Serve at room temperature, stirring well to smoothen before serving. The dip keeps in the refrigerator for 4 to 5 days. They really look excellent yummiiii! YUM! It seems it was an eggplant and pepper year in the garden! Can’t wait to try this recipe too.